At the moment we are seeing a huge boost in popularity to all things vintage, retro and classic looking – people like to fill their homes with vintage pieces of decoration and furniture, the trend is spurred on by websites like Pinterest and Etsy where you can shop for vintage items. This trend has also been extended into design with web designers and logo and identity designers also going for the vintage look for appropriate businesses, its a welcome addition which goes against the ultra-clean corporate look of recent times. If you wish to use this style of design for your own logo, which could be used for example on the following businesses – coffee shops, photographers, artists, hand-made goods, craft suppliers, artisanal foods etc, then this collection of free vintage logo templates could be what you are looking for. We have hand-picked a large variety of items which are completely free to download and use as the basis for your new logo, all you will need is a copy of Photoshop or Illustrator to start editing them. AI and EPS files are for illustrator and PSD files are for Photoshop so check the listing to see which file type you need depending on which program you wish to use. Take a look below, most of these items are free to use for personal or commercial purposes but check the license file of each just to make sure. This is another exclusive free vintage logo template pack which comes with 8 free carefully crafted vintage logo templates. All the elements are fully editable and scalable as your needs. This freebie pack was created by GraphicsFuel. 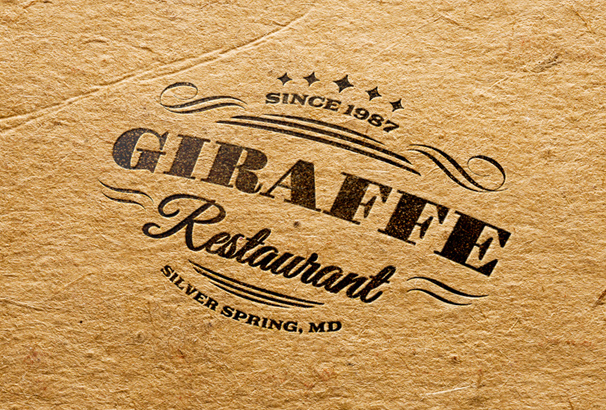 If you are looking for high-quality vintage logo badge templates then you are in right place. In this freebie pack, you will get 4 premium quality logo badge templates. Those badges are fully customizable and come in the editable text format. This elegant vintage logo pack contains 84 carefully designed vintage logos. Those logos are fully compatible with both Photoshop & Illustrator. So you can easily add your own contents within a moment. This awesome freebie pack contains 4 retro/vintage style sign/insignia templates in Adobe Photoshop PSD format from Cruzine Design. Those items can be easily exported to Png, GIF, Svg, Eps, Pdf or AI format. All those things were designed perfectly and come in high-resolution. This is a cool Photoshop badge or logo templates freebie pack. It contains 6 logo or badge templates and all comes in Adobe Photoshop (PSD) format. You can easily add your text or shapes and your logo will be prepared within seconds. 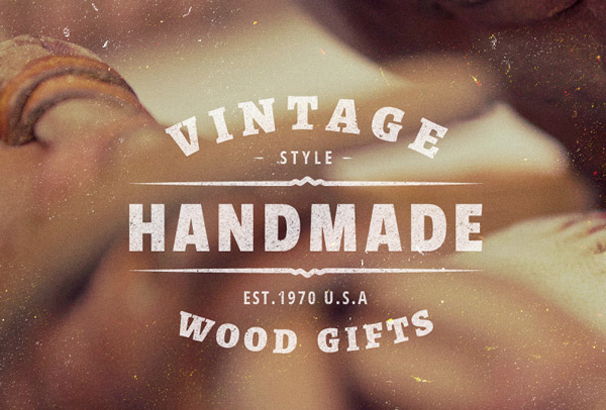 If you want to create a vintage style logo, then check out this freebie pack. Those logo badges are highly customizable and can easily change the text and shapes. You’re getting 16 high-quality vintage logo and badge Vector templates in this pack. This awesome freebie ink logo pack contains 20 high-quality logo templates. All the logos were designed perfectly and come in high-resolution format. This freebie pack was created by Agung Syaifudin. 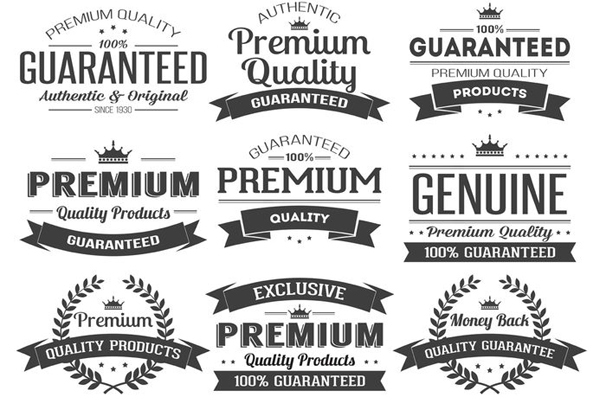 This awesome freebie pack contains premium quality label vectors. You’re getting 9 vector labels and those will be perfect for your websites, blogs, and products. This freebie pack was created by carterart. 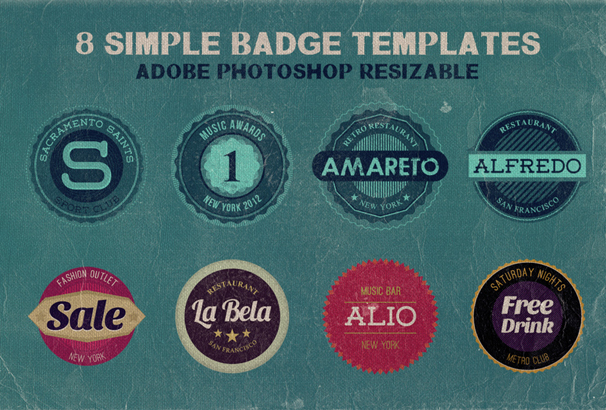 In this pack, you’re getting 8 retro/vintage style and simple badge templates in Adobe Photoshop PSD format. All the badges are easily editable as your needs and you’re allowed to use it both for a personal or commercial purpose. This freebie pack was created by Cruzine Design. If you are looking for high-quality retro typography level vectors then check out this freebie pack. 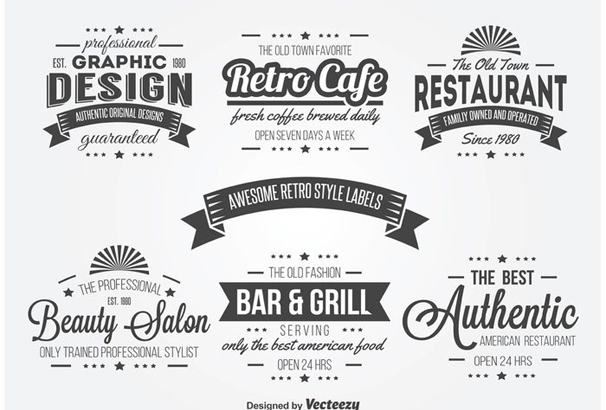 This set includes a variety of retro style labels great for use in a variety of projects. This awesome set was created by carterart. In this freebie pack, you’re getting 3 retro/vintage style badge/logo templates. All these badges come in Adobe Photoshop format. You can use these badge templates for creating logos, buttons or any types of promotional graphics. This freebie set contains a set of 5 vector insignias. All these elements are easily editable. So you can change the color, pattern, shape or text within seconds. This freebie pack includes all 5 insignias as an AI + eps file for versions of Adobe Illustrator, CS3 or newer. 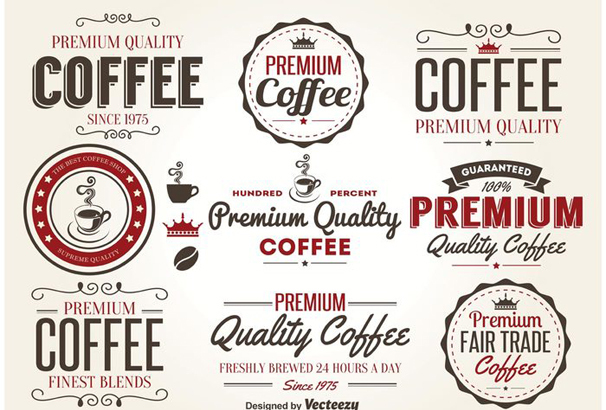 If you are searching for exclusive retro coffee label vectors then this freebie pack is perfect for you. You can use these on your websites, blogs and or products design. This freebie pack was developed by carterart and free to download and use. In this freebie pack, you’re getting 35 of Retro and Vintage design elements. It contains 20 vintage heraldry shapes, 9 grunge textures for vintage effects on your photos or designs, 4 logo/badge templates, 2 vintage style frame designs, All these resources come in Adobe Illustrator AI files, EPS, and Adobe Photoshop PSD files. 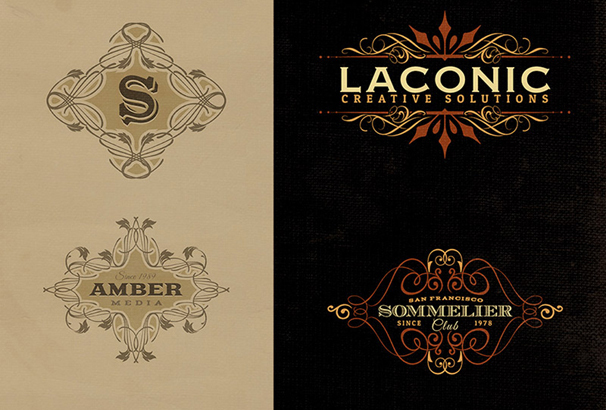 If you want to create your own vintage logos then this freebie pack will help you to do that. This pack contains a set of 8 vintage vector logo templates. These vectors are created in Adobe Illustrator so you can easily edit those vectors as you wish. This pack contains premium set Of 100 logos. By using these badges, you can easily create logo your website or app within a very short time. This awesome logo pack was created by Graphic Ghost. This vintage logo kit comes with 15 beautifully crafted, free vintage themed logo templates. You can easily showcase your branding, labeling and packaging designs by using this vintage logo kit. There are almost 21+ vector design elements and you’re allowed to personalize it to your needs. This freebie pack contains a set of 5 premium quality vintage insignias that can be used for logos, stamps or print. All of these are fully editable and scalable. This freebie pack is 100% free to download and comes in AI and EPS format. You can use these vintage typographic logo templates to create your own vintage style logo designs in Illustrator. These logo templates are free to use in personal or commercial projects. They can be customized, however, you wish. This freebie pack contains 8 free customizable vector vintage style logo designs. Perfect for creating new logo design. Download these free packs and customize the text to suit your own projects. 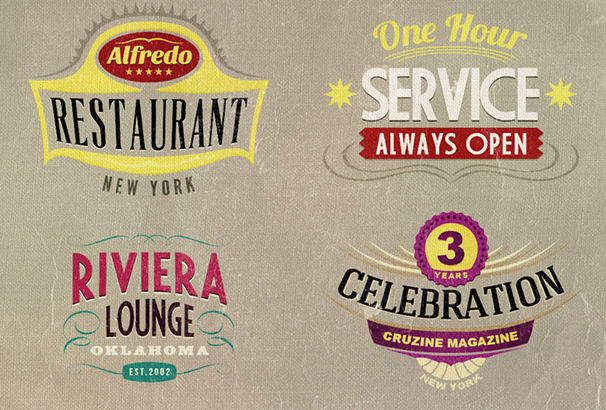 This exclusive freebie pack contains 5 highly detailed retro insignias. If you are looking for high-equally retro signs for your website, print design or logo design, then this freebie pack is perfect for you. In this freebie pack, you’re getting 6 free customizable insignias. 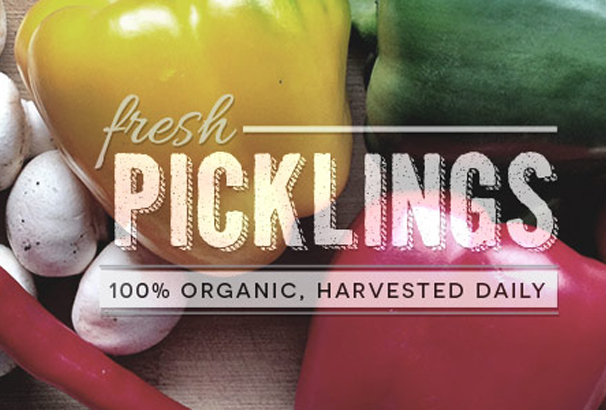 All the text layers are editable with freely downloadable fonts and every element is constructed as a vector shape. You can download it for free and create yourself a retro/vintage style logo in moments. This awesome logo design kit has a collection of 15 high-quality and those are ready to use vector logo templates based on the popular vintage theme. You can easily edit those logos with your own text and concept and it requires minimum Adobe Illustrator CS4+ to work properly. This pack contains exclusive vector based logos. This is a useful pack for any designers. All the logos come in vector based so you can easily edit the text, slogan and your logo will be done within minutes. Most of the typefaces available for free download and can use those both for personal or commercial projects. This is another amazing vintage logo kit pack. All the logos included in this pack are in vector based and you can just add your text and edit those logos and your logo will be done in few minutes. You are allowed to download it free and reuse for any purpose. This is another amazing logo kit pack come in PSD format. All these logos are easily editable and you can change the colors as your needs. This freebie pack is 100% free to download and use. All the badges come in AI and EPS format so you can easily change or modify these items as your demand. This vintage logo pack is perfect for a designer who wants to create amazing logo within very short time. All these logos are fully editable and you can replace those with your own text. 100% free to download and there’re no restrictions to use. This awesome pack contains 15 vector logos which are perfect for your next project. All these vector badges come in with vintage style. And all of these logos are easily customizable so you can make your own logo within very short time. This awesome pack was created by Agung Syaifudin. If you are looking for some creative style vintage logo kit, then you are on the right page. This freebie pack contains some exclusive logos in PSD format. So you can easily modify the text and enjoy creating new logos for your website, blog or products. 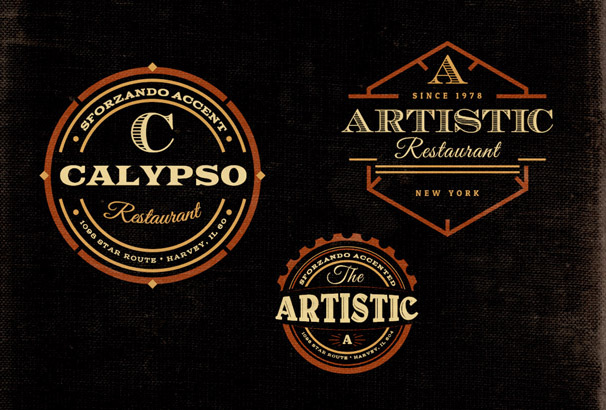 This freebie pack contains 3 exclusive vintage logo templates. All 3 logos are fully editable and come in PSD format and AI vector version, so you can resize and edit these logos without loosing the quality. This freebie pack was created by Vlad Cristea.